Vampires are the bloodsucking undead monsters that have captivated readers and moviegoers for years; werewolves the cursed lycanthropes who find themselves in desperate need of a shave at the sight of a full moon. Put them in the same film (Underworld) or slot (Vampires vs Werewolves from Cryptologic), however, and you get a bloodcurdling match made in heaven. 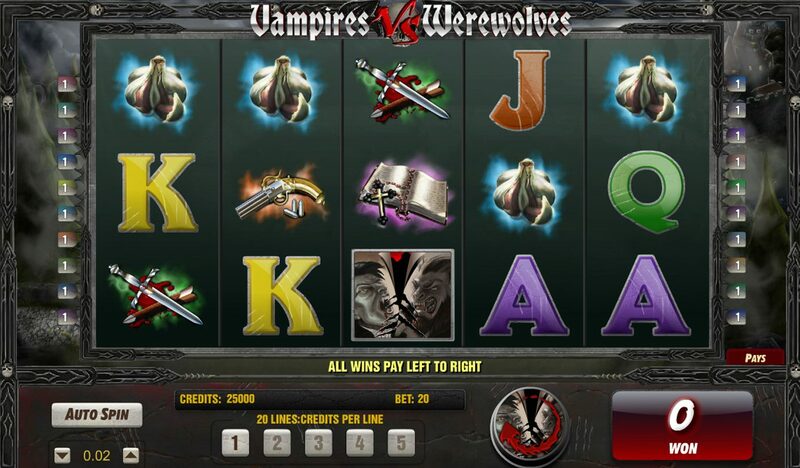 Vampires vs. Werewolves is a 5-reel, 20-payline slot with a ghoulish mist-shrouded background to put you in the mood. There's a nice range of coin bets - in the Cryptologic style - with five credits per line available for bigger bettors. On the reels, together with standard jack-to-Ace symbols, we get a pistol with silver bullets, garlic (always good to battle vampires with), swords, a crucifix and bible, plus a vampire and werewolf. The buxom damsel in distress - the familiar heroine from a hundred Hammer Horrors - is the Wild and substitutes for all the regular symbols other than the Scatters. If you land a vampire on reel 1 and a werewolf on reel 5 anywhere you'll receive an instant cash win plus bonus cash for every crucifix that appears in the corner of the winning symbols. Land three Bonus symbols anywhere on reels 2, 3 and 4 (look out for the Vampire and Werewolf attacking each other) and you'll trigger the main bonus feature. You'll see a board game on-screen. First, choose who you want to be - the werewolf or vampire - and roll the dice to move round the board. As you move round you can win cash and multipliers. The game finishes when you get to the end of the board or an enemy kills you. 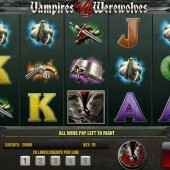 Vampires vs Werewolves is a nice-looking, simple-to-play slot from the trusted developer. The Trail Bonus game is a real payer (and I found it fairly easy to trigger) but the game could probably have done with some free spins to lift it above the norm. For my money, I still stand by Ash Gaming's horror-themed Full Moon Fortunes slot with its interesting shape-changing features, while Aristocrat's own Werewolf Wild has a great claw feature which swipes across the reels changing symbols Wild. Tuck into both today.